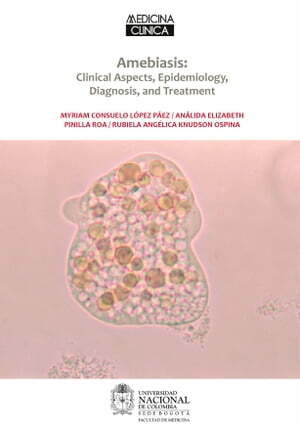 Collins Booksellers - Amebiasis: Clinical Aspects, Epidemiology, Diagnosis, and Treatmen by Myriam Consuelo López, Análida Elizabeth Pinilla & Rubiela Angélica Knudson, 9789587754605. Buy this book online. This book is made up of eight chapters that discuss different aspects that are key to the study of amebiasis. In the first chapter, we summarize the history of the disease, including descriptions of the first findings obtained by researchers and of the later scientific development to the present time, which has been characterized by studies in molecular biology and the resulting advances in technologies for diagnosing amebiasis. The second chapter describes the etiological agent, the life cycle, and the morphological aspects of the parasite. This gives the reader context for the Entamoeba histolytica infection process and for recognizing the parasite forms. In addition, it includes some images of the E. histolytica/E. dispar/E. moshkovskii complex. In the third chapter, the clinical aspects of amebiasis are introduced. We provide a description of the clinical manifestations of intestinal and extra intestinal amebiasis and place emphasis on the possible differential diagnoses. The fourth chapter focuses on presenting the virulence and pathogenicity factors of Entamoeba histolytica infections, and the aggressive and evasive mechanisms of the parasite are described.